The possession of land, tenements, and hereditaments in Delaware can be transferred by a deed in writing. The legal estate will accompany the use and pass with it (25 Del. C. 101). A form for the conveyance of real estate is presented in 121 of the Delaware Revised Statutes. This form, if duly executed and acknowledged, is sufficient for the conveyance of real estate. The words "grant and convey" in any deed will, unless specifically limited or restricted, operate as a special warranty against the grantor and the grantor's heirs and all persons claiming under the grantor (121). A grant deed contains some covenants of warranty, but is not as extensive as a warranty deed. In this type of deed, the grantor warrants that he or she has not previously conveyed the estate being granted and has not encumbered the property except as may be stated in the deed. A lawful grant deed includes the grantor's full name and marital status, as well as the grantee's full name, marital status, vesting, and mailing address. Vesting describes how the grantee holds title to the property. Generally, real property is owned in either sole ownership or co-ownership. For Delaware residential property, the primary methods for holding title are tenancy in common and joint tenancy. An estate conveyed to two or more people is presumed a tenancy in common, unless a joint tenancy is specified (25 Del. C. 701). As with any conveyance of realty, a grant deed requires a complete legal description of the parcel. Recite the source of title to maintain a clear chain of title, and detail any restrictions associated with the property. Each grantor must sign the deed in the presence of a notary public for a valid transfer. All signatures must be original. Finally, the form must meet all state and local standards for recorded documents. Note that each of Delaware's three counties requires a different format, so make sure to check before recording. In Delaware, all conveyances of real property require a completed Realty Transfer Tax Return and Affidavit of Gain and Value (9 Del. C. 9605(d)). This form must be completed by both the grantor and the grantee, and it must be submitted with the deed for recording. Property in Kent County requires a New Property Owner Information Form. This form must be completed by the grantee. Kent County also requires the payment of all state and municipal realty transfer taxes upon the transfer, except for the City of Dover realty transfer tax (See 9 Del. C. 9605(i)). In Sussex County, include an Affidavit of Realty Transfer Tax. It must be signed by the grantor and submitted with the deed. 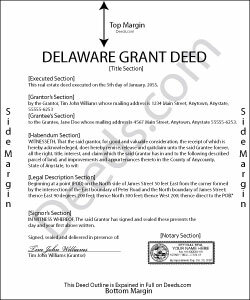 Before a grant deed can be recorded by a county recorder in Delaware, it must be signed and acknowledged by the grantor. Acknowledgments can take place in any county in Delaware, by any party to the deed. Acknowledgements in this state may be made in the Superior Court, before any judge in Delaware, notary public, before two justices of the peace for the same county, or before the mayor of the city of Wilmington. A grant deed can also be proved in the court by one or more of the subscribing witnesses (122). The acknowledgement or proof of an instrument should be certified by a certificate attached to the deed or endorsed on it (123). If a grant deed is acknowledged out of state, acknowledgements can be taken by any of the officers listed under 129 of the Delaware Revised Statutes. A recorder will not receive a grant deed for recordation unless it is accompanied by an affidavit of residence (9605). The recording statute in Delaware is a pure race statute. A grant deed, once acknowledged or proved and certified as provided, should be recorded in the recorder's office in the county where such lands are located ( 151). The recording of a deed for one county will take effect only in respect to lands or tenements mentioned in the deed situated in such county (152). Priority of instruments will be determined by the time of recording (153). This article is provided for informational purposes only and is not a substitute for the advice of an attorney. Contact a Delaware lawyer with any questions about grant deeds or other issues related to the transfer of real property. Ray L. said: Thank you, I am very satisfied with the process and will provide a final review after the documents are completed and accepted by the state.